A Legendary Experience Like No Other! When you book a Guided Tour with Hunter Springs Kayaks, your personal guide will take you on a 3-hour expedition, in convoys of 10 or less for a more intimate experience. Your group's exclusive journey will take you on a quest you'll never forget as you discover the many beautiful springs, uninhabited islands, caves, and wildlife of the area. ​Depending on location and season there’s a likely chance to see manatees, dolphins, otters, turtles and several species of fish and endangered birds. Our Guided Tour locations include (but are not limited to) Three Sisters Springs, Halls River and The Chasshowitzka River. King's Bay may be best known for our manatees and Three Sisters Springs, but there’s so much more to experience! From the various types of aquatic wildlife & vegetation to the remote springs that go unnoticed, you will be guided on a voyage to see the unique treasures often missed. ​ If you're looking for more of a secluded nature filled paddle, Halls River is the tour for you! Cruise through the incredible backwaters of Homosassa where the wildlife are abundant and undisturbed. This tour is a rare chance to see unspoiled Old Florida views and wildlife in the most natural of settings. King’s Bay and Halls River aren’t your destinations of choice? Join us on our journey to the remote salt-spring, known as The Crack, and back to explore the underwater spring-fed caves known as The Seven Sisters. This serene adventure is only found on the Chassahowitzka River. Our guides are very knowledgeable and will educate you about all the fascinating small-town history and little-known facts only a local may know. No matter the destination, your private excursion will take you on a legendary adventure with your friends and family to create memories that will last generations. Personalize your tour and meet each adventurer's individual needs with the choice of Kayaks, Stand-Up Paddle Boards, Hybrid SUPs or Canoes. Which would you prefer: Public or Private? A public tour is one where you may be grouped with other paddlers, up to a maximum of 10. Private tours are only limited to those in your party and may be customized depending on availability. !! 7 Days A Week !! 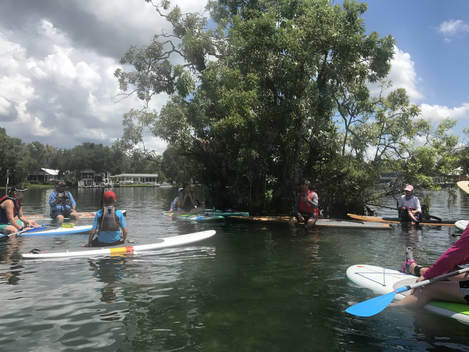 **Price includes guided paddle, your choice of vessels (Stand Up Paddleboard, Single and/or Double Kayak), in-water swim guide, wet suit, mask and snorkel. All watercraft come equipped with a life vest, whistle & paddle.